Ukraine's defence minister met with Mattis in Brussels. 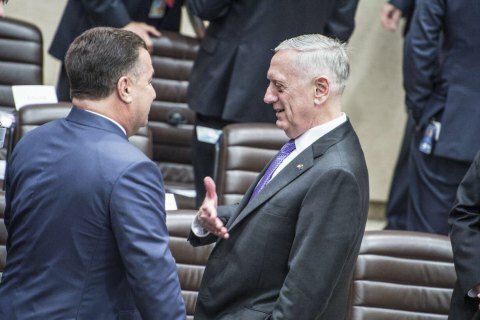 The head of the Pentagon, James Mattis, will visit Ukraine in the near future, Ukrainian Defence Minister Stepan Poltorak said on 29 June after a bilateral meeting with his American counterpart at NATO headquarters in Brussels. "We exchanged views on the situation in Ukraine and the world, the prospects for cooperation between the defence departments of Ukraine and the US. In addition, I had the honour to invite my American colleague to visit Ukraine," Poltorak wrote in Facebook. Ukrainian defence chief said that the visit will take place in the near future. President Petro Poroshenko said after the visit to the US that representatives of the US Presidential Administration Donald Trump will visit Ukraine in the course of the next two to three months to sign defence agreements. Later, Poroshenko announced the visit of US Secretary of State Rex Tillerson to Ukraine in July.